The living room mantle has been an area of our home that has been largely ignored, for good reason. I recently tweaked it a bit, but am still not loving it. Help? First, a bit of history. 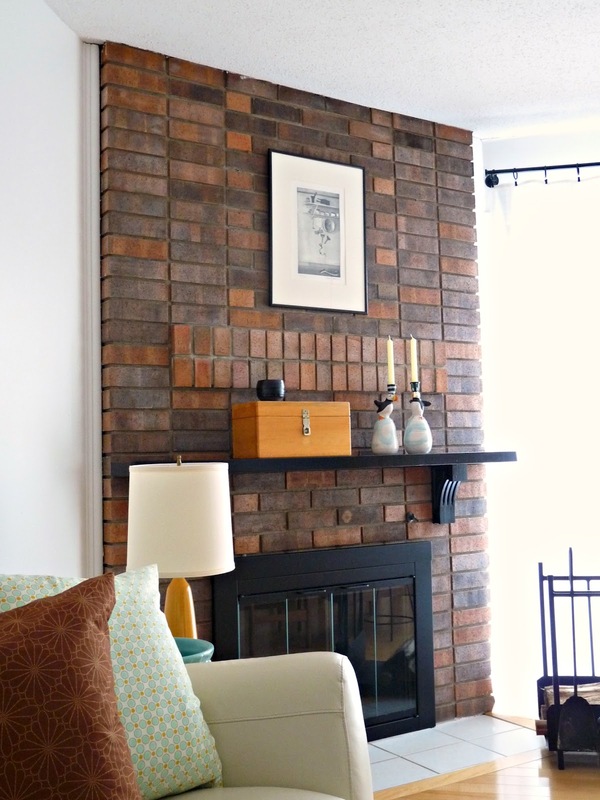 The original fireplace insert was so ugly, I couldn’t stomach glancing at the general area. When we hired a chimney cleaner we learned that, even though the home passed inspection with a home inspector we specifically chose for his knowledge of fireplaces, the insert was illegal. A new fireplace insert could be thousands. Instead, we had it professionally removed and everything was inspected and cleaned – to the tune of $400! We then added new and modern matte black doors and have since used it as a (legal) masonry fireplace. Less efficient, sure, but our house is so wee that even a modest flame raises the temperature substantially. The brick has been another thorn in my side. Longtime readers know I have long waffled about painting or not painting the brick. With Hubby vehemently siding on “don’t paint the brick,” I’ve left it as is. 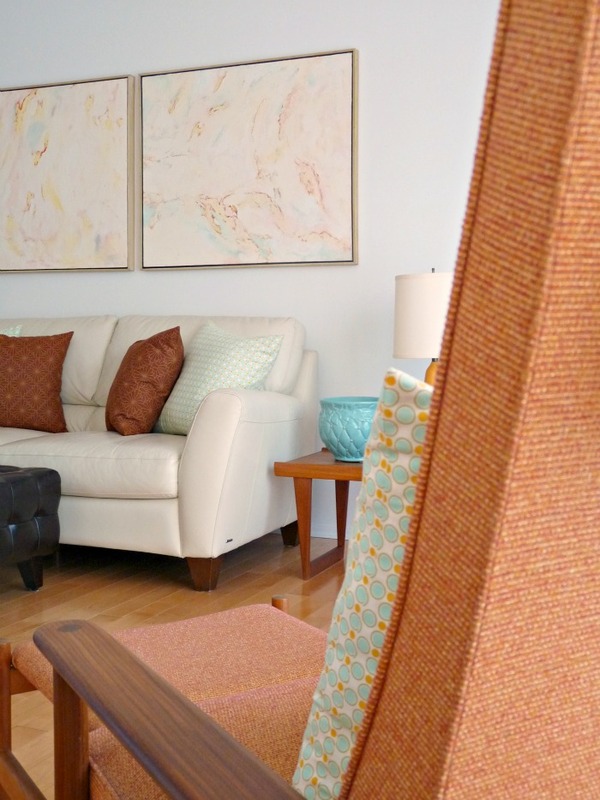 It does pick up on some of the other warm tones in the room, like the apricot upholstery, teak wood and even hits of a brick hue in the artwork, providing nice warmth against my penchant for turquoise. With our all-white walls, it adds a healthy does of colour and texture. So it shall remain unpainted, even if it makes it trickier to modernize the look. Even without the added aggravation souring me on the whole fireplace, and the exposed brick making it tricky to modernize to feel, decorating the mantle has kind of stumped me. My childhood home never had a mantle, so the concept is a little foreign to me. And ones I’ve seen are all “too” . . . This one, although more pared back in terms of decorative items, is too much of a statement maker. I don’t want to draw too much attention to the mantle (I’d rather make the artwork the predominant eye-catcher). This mantle is more my style: bold artwork? Check. Turquoise? Yep. But it makes too much of a statement again. A bolder styling like this might just detract from the two larger pieces of artwork immediately to the left of our fireplace. But then this one is a little too spartan. Our fireplace and mantle need a bit more of a disguise. I think only a truly gorgeous fireplace and surround can be this unadorned. So how did I “style” ours? 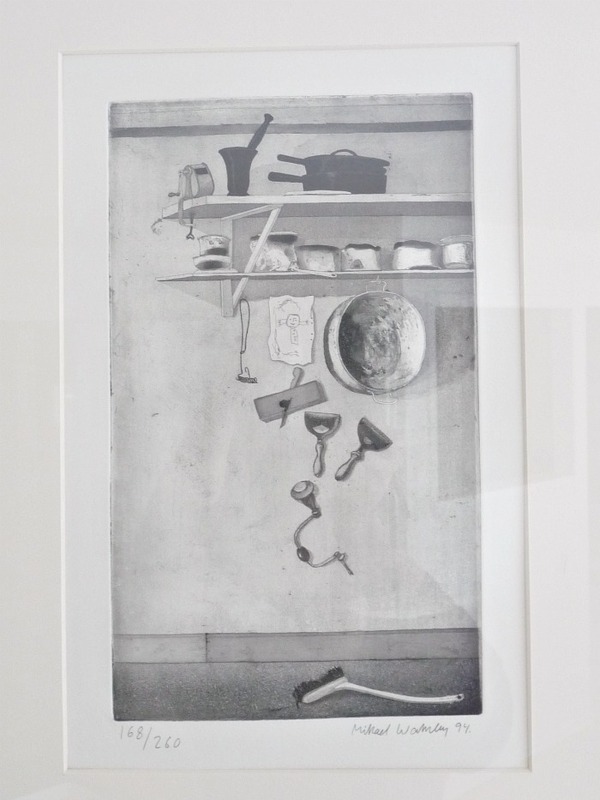 When we moved in, I threw up a quirky etching from a vintage shop immediately, because the former owners had drilled massive holes into the brick to hang their photos. I needed to hang something to hide the screws imbedded in the brick. Some days I’m unconvinced of the scale’s appropriateness, but I like that it is subtle and doesn’t compete with the other artwork. I added the candlestick holders, made by Hubby’s aunt, because they offered some height, and just recently I added a little wooden box 12 year old Handy Hubby made. Cue the collective “awwww”. 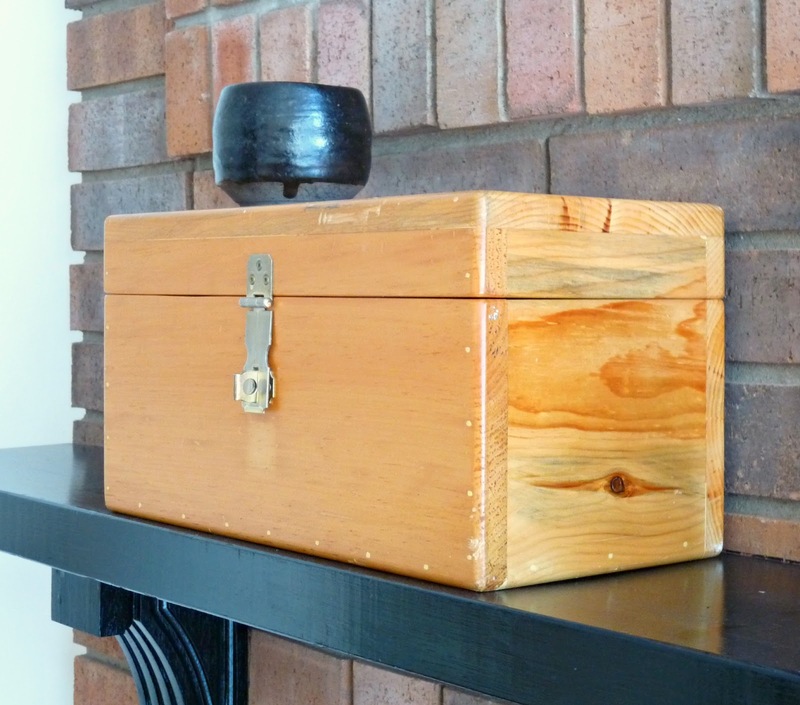 We were on the hunt for something to hide our kindling, and this box (languishing in the basement) fit the bill. I added a pottery bowl my mom made to hide matches in. I stacked it on top of the box to add more height to my little “vignette”. The finished product is hugely practical, but is it pretty? It seems the mantle needs something . . . should I paint the mantle? Make a new one (I cannot figure out how it’s attached – it is original). Add different artwork? The box, I think, is there to stay (at least during the winter months). Or do you think I am just fussing with the mantle to avoid the basement, a large and scary undertaking? Previous Post Business Cards: DIY or Don’t? I say GO BIG with the art (or big mirror if the reflection is decent). Something big in scale and then layer in a few pieces like your box. Quick drama I say. Even with two giant pieces of art one foot over? I like the idea of a mirror . . . We have one in the basement we took down from the bathroom. We could make a really chic frame for it . . . hmmm, thinking, thinking.Thanks for your input! I think if you painted the mantle it would definitely update the fireplace a bit, but you definitely need to switch up what you have on display. Some turquoise pieces would really update it a lot too. I know you dont want it to be a focal point, but in every house (including my own) that I've been to the fireplace and mantle draw attention. So I think if you add a bigger piece of art, or a mirror, and some more modern pieces that vary in height, the fireplace as a whole would "fit in" more with your other decor. What colour should the mantle be, do you think? I was thinking the same thing as Ashley. Paint the mantle. Brainstorm! Maybe paint it in the Glacial Till? Or even just white. Or turquoise. Or white with turquoise brackets or vice versa. 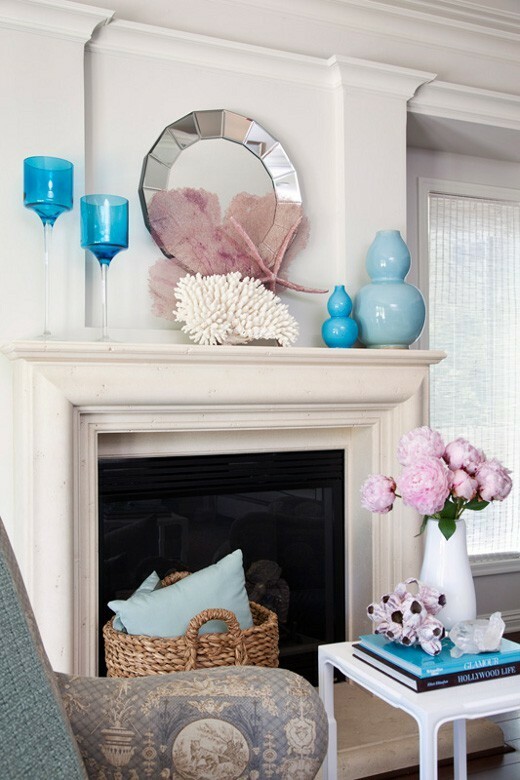 The mantle itself could be the statement piece without going overboard in decorating it with various items. Keep the homemade treasures on it, paint it, and add the mirror I say. I don't think it would take away from your artwork. It could be a nice compliment space. I don't know. Food for thought! Play with it, and then play with it some more. And then maybe a little more. Things like this always seem to be trial and error. You'll find your mantel groove eventually. I think that I would (personally) want to avoid hanging an oversized piece of art with the two other pieces adjacent (since you said you don't want them to compete). A mirror will add light and dimension to your room with no competition as it will just be showing off the parts of your space that you already love, which will also minimize the amount of brick exposed. A simple compromise between the paint & no paint camps. :)(random idea): Do you like succulents? Even if you aren't a house plant kind of person, succulents are very low-maintenance and you could have a miniature garden completely contained in a (very)small ceramic or glass cupglassbowl etc. which would help keep your mantel from being too busy or overfilled, yet not too spartan. A good seasonal option for when you want to swap out the winter decor. Painting the mantel: tough call. If the brick were to be painted a neutral I would probably leave the mantel as-is to match the fireplace & add some cohesion, then you could add your turquoise & other pops of colour with mantel decor. 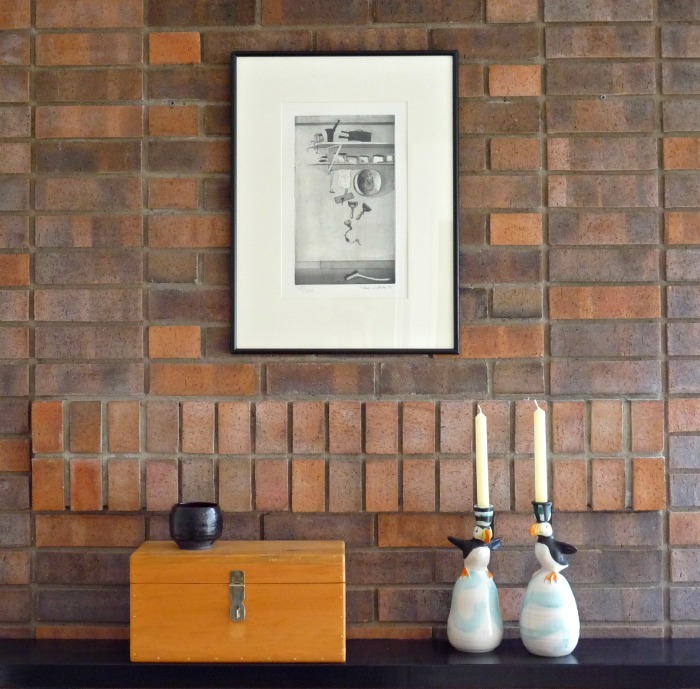 But, with the brick being natural, if you paint it the colour could possibly looks odd juxtaposed above the fireplace or draw too much attention to itself. As it is now, the colour is a complementary understatement to the tones in the brick, which isn't necessarily a bad thing as it allows for the opportunity for the mantel decor to be what draws the eye. Quick thought: if it works with your decor, some of those felted billy-balls you made in a (smallish) white-ish ceramic vase or milk glass would be a nice way to contrast the brick, bring in some colour, and add a little height variation without going overboard (levels, it's all about the levels..oh wait, isn't that gardening? layers&levels proably go hand-in-hand with vignettes too). 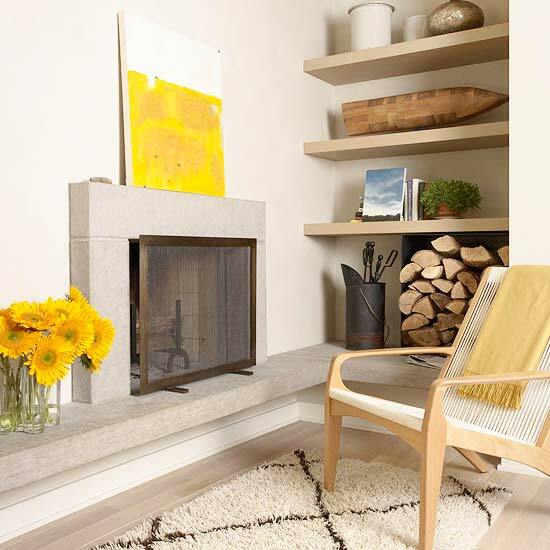 What about building a new contemporary style mantel. I'm seeing white and clean lined. Might be nice against the brick. I agree with hanging a mirror. I always love them above a mantle. Then you could introduce little pops of color with accessories and change them over time. You could build out a white box around the current mantel, and secure it to the original mantel in a discreet way… in case a future possible buyer is interested in the original, it would still be there. I do think that some form of white mantel would lighten up that area and speak to the rest of the white in the room, while still allowing the brick to be a moody counterpoint. PS– the burnt orange pillows are doing a pretty good job of tying the brick color in somewhere else in the room–I like it. Thanks Staci! The art & teak we had, but I added the pillows and chair once we moved here so I definitely think I was subconsciously influenced by the brick in my design choices. But thanks for the vote of confidence in my choice of keeping the brick! I see painted brick everywhere and am always tempted to just paint it, but when the sunlight pours in, the room looks cozy and modern even with the brick. It has grown on me. I love the brick…. it is subtle & clean. Please don't paint it. I would hang a larger frame OR add mirror & sit the framed print in front. Move the wooden box/matches to the hearth. Add a couple of ceramic items on the mantle or small plants to add colour which would contrast well with the brick colours. I like the mantle black because it echos the fireplace doors! I concur with some of the other comments about going with a big mirror instead of the etching – it would fill more visual space but not necessarily compete with the art above your couch. And if the mirror can fill more of the middle space of the mantle, you can separate the box and candlesticks a bit so there's not so much space on either side of the mantle. I love your husband's box on the mantle! It really pulls the warm tones out of the brick, and just feels so 'right'. I've decided like the mantle itself as is, and agree, it works with the fireplace doors. At first I was headed in the distressed, weathered deep grey direction in the form of a reclaimed beam set on vintage corbels, but now I think that would be too weighty. 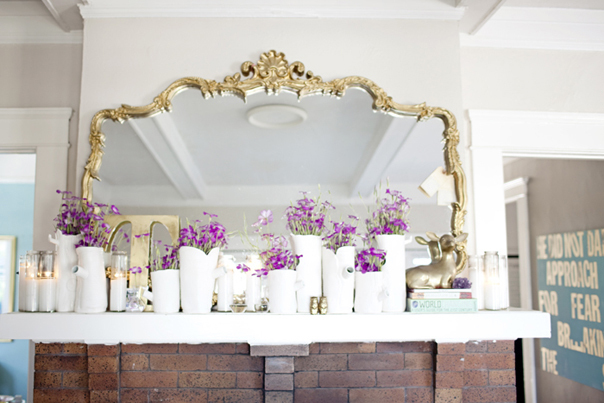 I love the idea of a large mirror, maybe an antiqued mirror? The one thing I'm seeing… the white of the print actually pulls in the white of the tiles of the hearth tiles. That's something to keep in mind, because without something white up higher, the tile will stand out. It needs to connect to something… When you look at your first photo, you can really see a nice balance overall between your lamp, your print, and the hearth. I actually don't mind what you have going on… so with that in mind, maybe a larger print framed in black is the way to go. Just a thought. I actually don't mind the brick (rare statement from me when it comes to old fireplaces) but I feel like it needs to be framed out with some wood to update it. Maybe a heavy base that you could build and install. One thing I have never forgotten from my design school days is that we were always told "a fireplace will ALWAYS be the focal point in a room". Knowing this, I would say that your desire to keep it understated might be what's causing some issues. I think you need to embrace it as a focal point and do everything you can to make sure the attention it's already getting is positive. Or just change up the art over the sofa? I mean, play around until you get it! I love the art. The size of it is perfect and it is hanging in the perfect spot. The bricks surrounding it almost seem to frame the piece. The penguin candlesticks are a little out of place to me. But I imagine with spring around the corner, some succulents or boxed grass would look great in their place. If you are itching for a change, maybe the mantel is a good place to look. I don't dislike it though. I think the whole setup is pretty charming. Thanks Julia! I've been trying . . . I think my first attempts at dressing up the mantle were less inspiring. P.S. They are puffins. I'm only mentioning because I heart puffins with a mad passion and they deserve some love and recognition. Both male and female puffins work to "feather their nests". What a cute symbol of a DIY pair! But because of hunting, their populations are threatened. So don't eat puffin meat. Good to hear! If I can save even one puffin from the dinner plate, I feel like I've made a difference, lol. Corner fireplaces are super tricky! I agree with Carol that no matter what you do, it will be the focal point. I had one in my last home, and it was always a bit of a dilemma for me! I love the idea of a chunkier more modern-looking mantle. If you go with a big mirror you can still layer in your etching, box, etc. I would leave the mantel black, because I think it looks great with the fireplace doors. I can picture one of the CB2 Perspective mirrors hung above the mantel. I'd leave the box and black bowl, because they look so good with the brick (which I wouldn't paint either), and then you could find some great turquoise vases. Lamps Plus has some in great shapes! I actually really like the art work. I say keep it but I also think you can't go wrong with a fabulous mirror. I like the box t0o. Maybe you can remove the two candle sticks and substitute something else there. I have exposed brick as well and have decided to embrace it. ;)I love the inspiration photo with the big gold mirror. I really like your mantle. I was thinking of some colorful vases and more pictures. Are you guys thinking about painting the fireplace at all? Thanks, Beatrice! 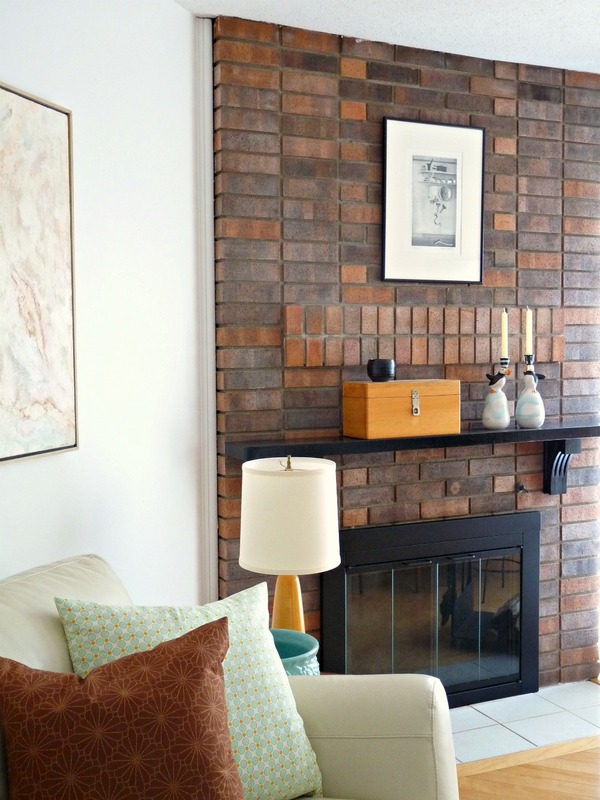 The brick is staying, the doors are new but the mantle and all decor are open for changing. I think brick is so hard, it softens the look more when a nice big canvas is placed on it, layered with additional pieces. Could you move one or both of the canvases that are currently above the couch to the fireplace instead? 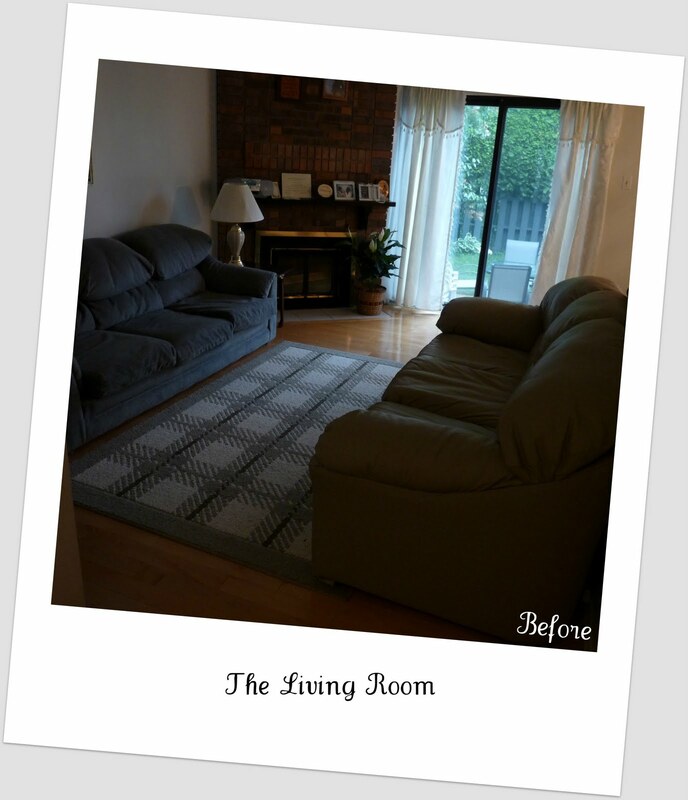 It would really soften and lighten it up… as well as tying the whole room together. 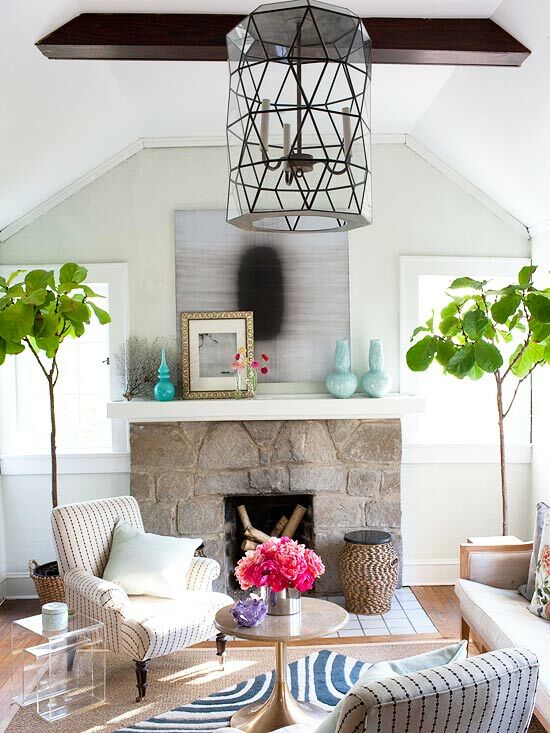 I often am not a huge fan of mirrors above fireplaces… Then above the soft couch you could do a nice Jere sculpture or something (the sunburst with birds can usually be found affordably). 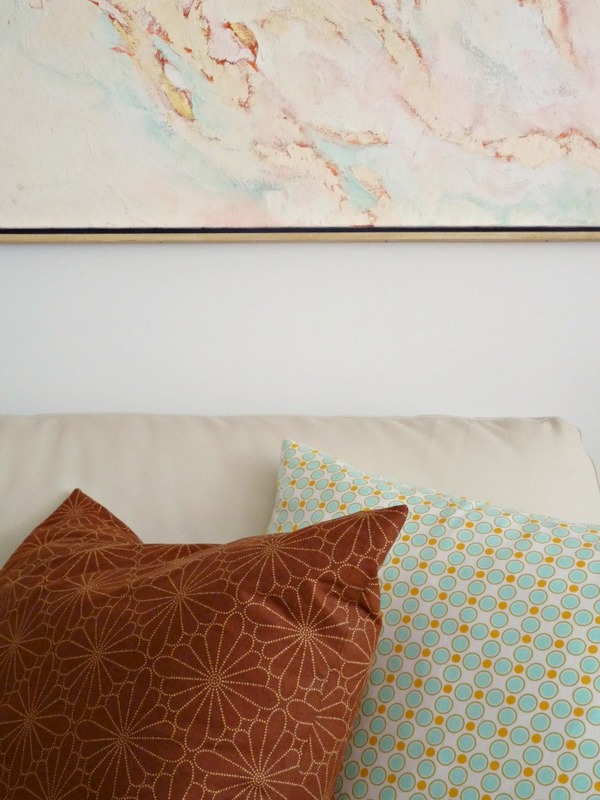 I also love screen printed art like Marimekko wall hangings or vintage Marushkas. I would go with some Danish teak candlesticks in place of your puffins (which might be nice in a kitchen instead…) Good luck! Thanks!!! Your comment was so encouraging. I try to go off-script and break (some of) the rules, but sometimes I think I end up in the weeds as a result. I think I might have an idea, but I promise if I follow through, it's kind of wacky.Thanks for your vote of confidence! I really appreciate your kind comment. I love your home! So bright and your colors just pop!!! Mantles are tricky– so I think you should wait until you get the burst of inspiration to change it up. Besides, I think it looks nice as it is 🙂 I love the etching and your husband's box is a really nice touch!!! I wouldn't paint the brick – it looks really nice like it is. We covered up all of the brick on our fireplace, but it was a behemoth that is way too large for the room and the brick was in bad condition and ugly to boot. Yours looks just the right scale and the brick looks nice. I think you just need a larger piece of art. I think if you paint the mantle you should beef it up a little first by building the top up so it makes more of an impact. Tanya I do like your fireplace very much! I think it makes a statement itself with the brick and all. And I like the brick as it is unpainted. It gives a warmth. My opinion is not to paint it. As for the decor I think it lacks something to give it an air of freshness, something like a vase with some flowers, more candles. What about many candle holders in a row? I love what you have done. Simple with a touch of handmade. I love it. Would you consider adding a plant? I see someone recommended a succulent, which would be awesome. Or something easy with a little more presence, like a pothos. Or even cut flowers? However, those are a little more temporary, but can reflect the seasons well. Just some thoughts. I just found you blog and love it. I am struggling with my retro fireplace as well. This has helped me a ton. Looking forward to more posts. Well, folks, I loved all of your advice and went ahead and added a mirror (a common suggestion). To keep it more "me" I antiqued it and stenciled on a Hungarian poem:http://dans-le-townhouse.blogspot.hu/2012/06/poem-stenciled-on-to-antiqued-mirror.htmlI'm sure it will continued to change as I still have plans to maybe change the mantle, etc, but the mirror added so much light and helped make the fireplace a cheery focal point. Thanks again for chiming in!